Every year on November 1st I remind my readers that death is not only not an evil to be feared, but a good to be celebrated; all things are mortal, and old things must die to make room for and feed the new. And four days later, again every year, I remind my readers that this is no less true for nation-states than it is for living organisms. Countries and empires, like organic beings, are born from other cultures; they grow, mature, age, fall into decay and eventually die, and their remains nourish the next generation of nations. But those new nations aren’t necessarily foreign, so to speak; sometimes dead things are dragged off and devoured by creatures from elsewhere, but very often they rot where they fall and give rise to new life right there in the same soil. If you don’t quite get where I’m going with this, remember that the ancient cultures of Mesopotamia weren’t usually succeeded by invaders from elsewhere, but by their own former subjects; the Assyrians were once subjects of the Babylonians, and the Chaldeans and Persians subjects of the Assyrians. 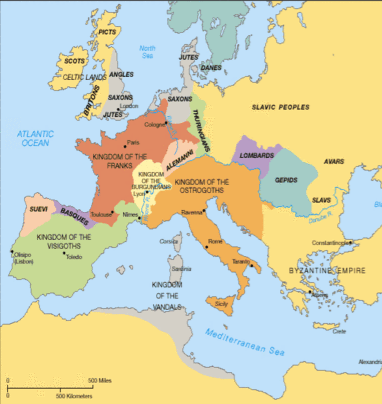 And when the Roman Empire collapsed, individual countries arose from what had once been Roman provinces, and Spain, Portugal, France, England and Germany each became world players with empires of their own. The British Empire in turn spawned a number of powerful nations as it fell apart, and now the American Empire is decaying and will collapse within the lifetime of some of you who are reading this. I myself will probably not live to see it, but it’s a virtual certainty that those of you now under 30 will. The United States, however, is no more a monolith than the Roman and British Empires were; it contains within it 50 independent states and a number of territories, not to mention its many satellites around the world. As the central government loses control and implodes, the governments of the various states will need to take up the functions Washington is no longer willing or able to provide (I consider the slow procession of states abandoning the cannabis campaign of the drug war to be an early harbinger of this). Several states already have populations and economies that would put them among the largest countries in the world if they were independent, and even the poorest and least-populous states fall within the spectrum of sovereign nations. Once the central government is gone or slowly descends into a mere symbol like the Papacy or the title of Holy Roman Emperor, the states will begin to function as independent nations; they will form alliances, trade with one another, and war amongst one another; strong states may conquer neighboring weak ones, and groups of small states may combine into new nations or even claim to be the legitimate successors of the American tradition, just as Constantinople and the aforementioned Holy Roman Empire both claimed to be the legitimate successors of Rome. And just as nobody in Odoacer’s time could’ve predicted that the rather small and isolated province of Britannia would one day rule an empire far larger than that of any Caesar, so it’s impossible for any of us to predict which American states might one day come to rule many or all of the others. And when that day comes, I hope its rulers remember the fates of the great empires that came before it, and perhaps learn from their mistakes so as to slow that New Empire’s descent into tyranny and collective hubris. I read a couple other blogs besides this one. One of the main themes discussed on those, over the last few years, is that it’s NOT impossible to predict. Wow! My mind is spinning. This is something I have never thought of. Thank you. I wonder who’ll be Warlord of Texas? As this happens, police chiefs across the nation will declare themselves in charge, they have the guns, the goon squads that like to hurt people. And they’re still hopelessly outnumbered. All it takes to overthrow any police force in any US state is sustained participation of about 3.5% of the population. Not to mention, how would you expect those ‘chiefs’ to maintain the loyalty of those goons once they run out of money to pay them (money that would be reduced to worthless scrip in an economic collapse anyway) and quickly run out of the parts and ammo with which to sustain their gear. On a not unrelated note, I wonder if the outcome of last night will soon result in the fast forward button being pressed on this whole process.